CME Group's Center for Innovation today announced that Apple co-founder Steve Wozniak is the 14th recipient of the CME Group Melamed-Arditti Innovation Award. CME Group presented the award at the 11th annual Global Financial Leadership Conference in Naples, Fla., on Tuesday, Nov. 13. 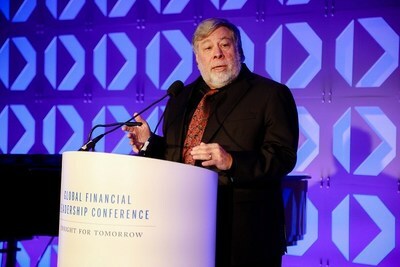 The award recognizes Wozniak for his significant contributions to computer science and technology. In 1976, Wozniak and Steve Jobs founded Apple Computer Inc. and debuted Wozniak's Apple I personal computer. The following year, the company introduced the Apple II personal computer, featuring a central processing unit, a keyboard, color graphics, and a floppy disk drive, helping launch the personal computer industry. Wozniak is well-known as a Silicon Valley icon and prominent philanthropist. The CME Group Melamed-Arditti Innovation Award strives to celebrate innovation that, through practical application, has had a positive impact on the economic well-being of individuals, industries or nations. This award honors an individual or group whose innovative ideas, products or services have created significant change to markets, commerce or trade. "Steve Wozniak's impact on modern technology cannot be overstated," said Leo Melamed, CME Group Chairman Emeritus and co-founder of the Melamed-Arditti Innovation Award. "His pioneering innovations in personal computing still help power our economy today." "I am honored to join a distinguished roster of recipients of the CME Group Melamed-Arditti Innovation Award," said Wozniak. "I have dedicated my career to building a better world through technology. Only through fostering innovation can we develop the solutions that will meet the economic and business challenges of tomorrow." In recognition of his achievements, Wozniak was awarded the National Medal of Technology in 1985 and was inducted into the Inventors Hall of Fame in 2000. He was awarded the prestigious Heinz Award for Technology, The Economy and Employment for single-handedly designing the first personal computer and for then redirecting his lifelong passion for mathematics and electronics toward inspiring grade school students and their teachers. In 2014, he was awarded the Hoover Medal, an honor given for "outstanding extra-career services by engineers to humanity," and was welcomed into the IndustryWeek Manufacturing Hall of Fame. In October 2017, Wozniak co-founded Woz U, a tech education platform dedicated to educating and training people in employable digital skills without putting them into years of debt. He also started the Electronic Frontier Foundation, and was the founding sponsor of the Tech Museum, Silicon Valley Ballet, and Children's Discovery Museum of San Jose. Wozniak holds a degree in electrical engineering/computer science from UC Berkeley. The CME Group Melamed-Arditti Innovation Award recipient, formerly known as the Fred Arditti Innovation Award, is chosen annually by members of the Competitive Markets Advisory Council (CMAC). The award's namesakes are Leo Melamed, in recognition of his revolutionary achievements in introducing financial futures instruments to the world in 1972; and former CME Group Chief Economist Fred Arditti, who was instrumental in developing the IMM index upon which CME Group's Eurodollar futures contract, the world's most actively traded futures contract, was based. Past recipients of the award can be found on the CME Group Center for Innovation website.